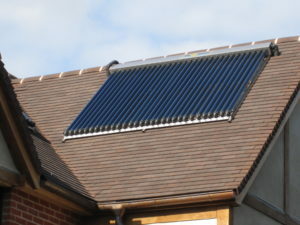 The solar panels are working and collecting heat very well. My solar control software is controlling three panels, two tanks, three pumps, several solenoid valves, and dumping excess heat to my interseasonal thermal store. I have not found it easy to do this and have had several teething problems. A thermostat failed and started reading 15°C above the real temperature directing cold water to my hot cylinder — took a week to find the problem. During March the system started to over run after dark slightly cooling the bottom of my hot cylinder. The current problem is how to collect heat efficiently into my thermal store once the hot cylinder has reached 60°C – generally this happens before lunch in April 2010. I am starting to get concerned about the whole thing overheating and me not being able to dump heat fast enough when we get into summer. Passive solar heat gain has worked well during the winter and in April every year I started to shade the front windows by closing or partially closing the roller shutters. This was only necessary from 10am to 1.00 pm initially and was most important for the landing window which is large compared to the area of the landing. In late 2015 we installed solar pv on the roof offering good returns on our investment and reducing our electricity bills. I am now paid more than I am charged through my bills for the electricity that I generate.